Thirteenth medical emergency in four years at this notorious California abortion facility. 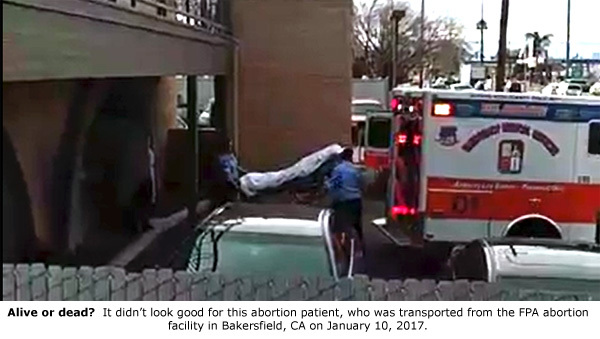 Bakersfield, CA – When the gurney rolled out of the Family Planning Associates abortion facility in Bakersfield, California, on the morning of January 10, 2017, it didn’t look good for the patient. She lay motionless on the gurney — completely covered from head to toe with a white sheet — as emergency responders loaded her into the ambulance. There wasn’t even an IV attached to her arm, as is often the case in this kind of emergency. 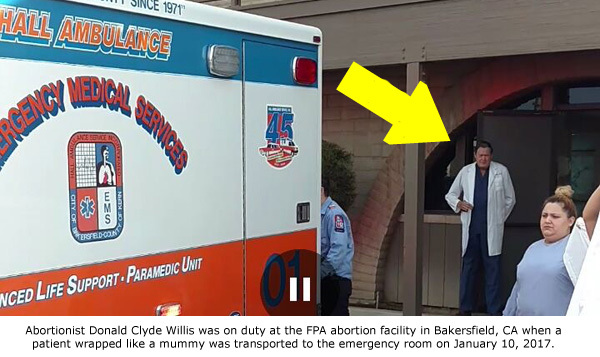 The ambulance had been greeted at the front door of the abortion business by Donald Clyde Willis, the abortionist on duty at the time of the incident. Facility workers at first came out to deploy sheets to block pro-life activists from filming the incident, but then decided against it and returned inside the facility. Terri Palmquist, a long-time pro-life activist with LifeSavers Ministries posted video to Facebook Live, imploring viewers to let people know what was happening. She sought prayers for the woman on the gurney and her baby. This was the 13th medial emergency documented at the Bakersfield Family Planning Associates since August 2012. The abortion business, which operates a chain of 22 abortion centers, has experienced difficulty maintaining an abortion provider at the Bakersfield facility. Willis is the latest in a long list of abortionists, most of which have left after medical emergencies were documented.